Thailand is set to develop more smart cities following their pilot project involving three cities. Deputy Prime Minister, Prajin Jungtong said in a speech in November 2017 that the aim is to have 100 smart cities within two decades to improve the quality of life in urban centres. The three cities involved in the pilot smart cities programme are Phuket, Chiang Mai and Khon Kaen. The government plans to develop three more cities that are also a part of Thailand’s Eastern Economic Corridor (EEC) - Chon Buri, Rayong and Chaochengsao. There are also plans to develop Bangkok as a smart city too. The recent focus on smart cities in the country is all part of the government’s Thailand 4.0 initiative. Thailand 4.0 is a new economic model that aims to transform Thailand into a high-income nation. Thailand have identified 10 S-curve industries that will propel the country to become a developed nation. The S-curve industries are divided into two categories – S-curve and New S-curve. S-curve refers to existing industries such as smart electronics, food technology, agriculture, automative, and medical tourism; meanwhile the New S-curve involves robotics, aviation, biofuels, medical hubs and the digital sector. Many of the initiatives required to achieve Thailand 4.0 would integrate newer technologies to ensure efficiency and bring Thailand into the future. 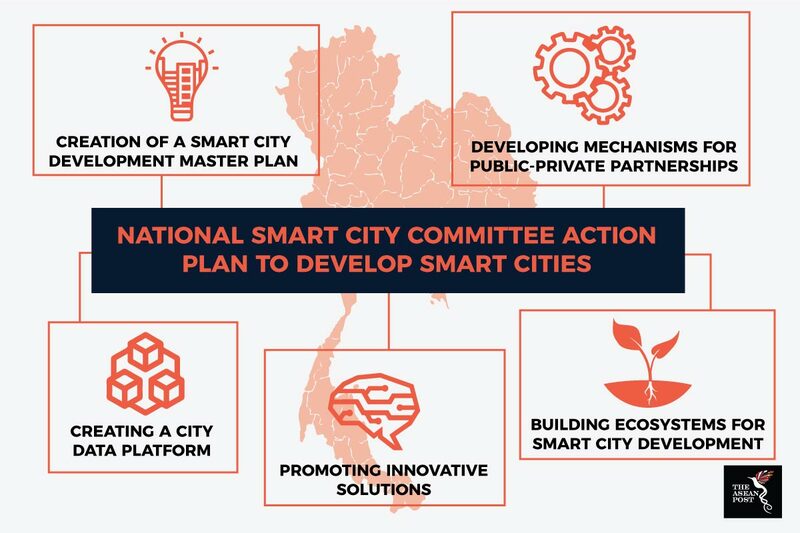 To promote and facilitate the smart cities scheme, the Thai government has set up the National Smart City Committee. The government has enlisted help from the Digital Economy and Society Ministry, the Energy Ministry as well as the Transport Ministry. In addition to that they will also receive help from permanent secretaries from 10 ministries. Currently there are three cities under the pilot smart cities scheme. The first phase of the project was launched in Phuket in 2016, while smart city initiatives in Chiang Mai and Khon Kaen started in 2017. When the pilot programme was launched in Phuket, the Thai government dedicated US$11 million to the island. According to data from the Thai government, this injection of funds is expected to grow Phuket’s economy by 4.5% in the next five years. The Digital Economy Promotion Agency (DEPA) that is working with the government to create smart cities in Thailand, chose Phuket as the first city to lead the initiative because of it’s reputation of being one the biggest tourist cities in the world and also because of existing technology infrastructures. While the implementation of Phuket as a smart city focuses on its potential of becoming an international hub, the smart city initiative in Chiang Mai focuses more on promoting smart agriculture. Since Chiang Mai’s main industry is agriculture, DEPA has partnered with Maejo University to develop wireless sensors for farm land irrigation to minimize water wastage and to increase productivity. Aside from that, in an effort to boost local tourism, DEPA has also developed a mobile application using augmented reality to provide historical information for tourist attractions in Chiang Mai. Meanwhile, Khon Kaen, the third city chosen for the pilot smart city programme, is geared towards becoming a medical hub, a transportation hub and a MICE (meeting, incentives, convention and exhibition) city. As a smart healthcare hub, Khon Kaen Hospital is integrating technologies to create a seamless emergency medical system. The system they are developing would involve integrating an emergency app with ambulances and a control command centre. Khon Kaen is also developing a smart bus project to shuttle commuters into the city. The project brings together different technologies such as the Internet of Things, GPS tracking systems and apps to improve the customer experience. Thailand’s aim to escalate this project to other cities is welcomed by all parties. DEPA is planning to develop these seven cities into real smart cities by 2023. If they manage to pull this off, Thailand could lead the way in developing the ASEAN Smart Cities Network that was discussed at the ASEAN Foreign Ministers Retreat earlier this month.